Cozumel – lets try to scuba dive! So I arrived at Cozumel this Wednesday. I’m staying at a hostel called Hostelito, very clean and nice! But the dorm is big, for 26 people, and it was like 15-20 places occupated in the dorm. I was sleeping quite close to the showers and bathrooms, and there was a reality film team about 10 people here who got up really early, they all showered around 2.30-4.30 in the morning, and packed all their equipment etc…. I couldn’t sleep at all. It felt weird to know that everyone passing my bed could see me in my bed. And it was hot too, the two ventilators in the roof on the sides of my bed wasn’t working, and my back did hurt a lot so I couldn’t find a good position to rest it and sleep. I had my first class at 8.30, but I changed it to 12.30 because I only managed to sleep like 2 hours that night. When I got to the place where I’m getting certificated, it was really close that I wasn’t able to start the classes, due to my training astma. But after talking about it for like 30 minutes and since I haven’t needed to use my inhalator in over 10 years, they let me do it. PHEW!!! I was so close to just start crying right there, haha. Since I was so tired that day I watched 5 videos about diving, and saved the diving for next day. It was the 14 of february, valentine’s day, and I was supposed to be alone since Duilio was staying for a couple of days more in Holbox, but he got here in the evening :) Aww. We wanted to have a private room here at the hostel, but they didn’t have anyone available, only a suite which we got for 420 pesos instead of 650 pesos… and wooow, so big!! We have our own room, bathroom, shower, kitchen, balcony, living room.. haha. It’s amazing!! And the bed is sooo good! Haha. As duilio said when we went to bed ”Wow, I can’t believe this is true, the best sheets ever, so soft, without any holes or dots”. Haha. Yeah. We have had some really lousy rooms and beds before, with steel wires coming out through the madrass! Haha. Our kitchen and living room! To the left we have a big balcony and the door there leads to our bedroom. So big! Anyhow. 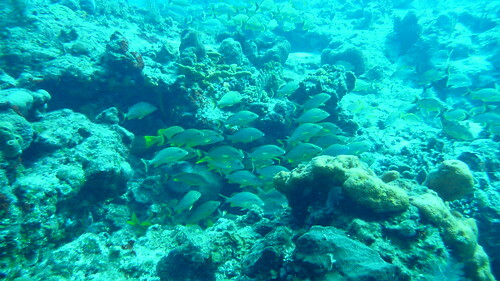 Next day I had my first scuba dive, and woooow, it’s totally another world!!! My instructor hold me in the hand the whole time. We went for 3 dives that day, and this is some of the things I’ve learnt: Equipment preparation, safe check, descent, buoyancy control, mask clearing, regulator recovery and clear, to use and alternative air source, underwater exploration, ascent and I’m sure some more stuff. My instructor said that the moment most people have problems with is to take of the goggles underwater, swim without seeing them, and then put them on and blow out the water so you can see again. But it wasn’t that scary. Everything has been amazing. It’s so weird to be down there with the fishes, it sort of feels like your are an intruder, visiting their calm home. Its fascinating. And it looks like they are flying around you since they are buoyancy. So.. what I love about our stay here is the scuba diving, and our room. But Cozumel itself is disappointing. There are American cruise ships that anchors here for like 12 hours, and all the tourists go out and get drunk and buy diamonds, Cuban cigars, tequila and artesanias… 90% of the people you see here are americans. The rests are scuba divers, haha. And the town itself or the people here isn’t really anything special…. No… so I will try to have some more dives so I can enjoy the world underwater.. Cozumel is one of the top ten best diving places in the world, let’s take advantage of that! Studying to get the certificate.. So I got the day off and we hired some bikes to bike around the island, but damn it, the worst bikes ever!!!!! Mine had the brakes against the wheel the whole time so it was a heavy and made a weird noise all the time, the gears didn’t work at all, we had to manually lose the chain to change the gear, on both bikes! Oh, but the worst was that it didn’t have any go in the bike, like it was on level 1 all the time even if we manually changed it, so bad.. so we had to pedal a lot and didn’t get anywhere! The bicycles handlebar was a little bit crooked so it turned left all the time… what more.. oh, worst saddles ever! So unfomfortable… We bicycled to the southest point on the island, it was 32 kilometres.. and it took like 3 hours! We watched the sunset there and then we bike back in the dark, and had all the wind against us, so heavy, we were sooo tired, and our buts were really soar.. haha. Now we are dead… But yeah, biking 62 kilometres when you are not used to bike that much does that to you. Out bicycling around the island…. 32 km to get to the southest side of the island..
At the Punta Sur, or final destination, quite tired. Only 32 km back home then! Let’s hope I can get my certificate tomorrow! Det här inlägget postades i Mexico och märktes Cozumel, Quintana Roo, Scuba diving, valentine s day av sofia armenteros. Bokmärk permalänken. no me quejo del ejercicio si no del dolor….